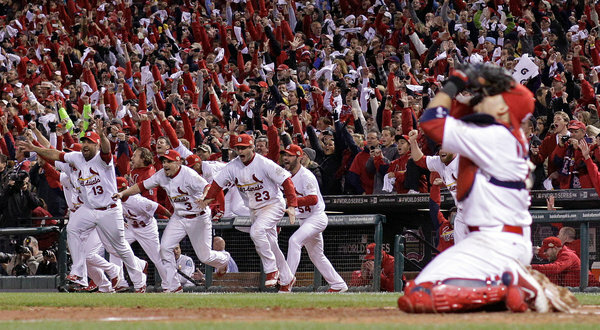 In game 7 of the 2011 World Series, the St. Louis Cardinals beat the Texas Rangers 6 to 2 at Busch Stadium. It was just at the beginning of September that the Cardinals were out of the hunt and it looked like there was no way they would surpass the Atlanta Braves to get into the playoffs. After a historic comeback, the Cardinals got in and have powered their way to the World Series. Add to that being down 3 games to 2 and making not one, but two comebacks in game 6 to force a game 7, and the Cardinals win this year for their 11th World Series title is simply phenomenal. This is the Cardinals second championships in five years. In the other dugout, this is the second year in a row that the Texas Rangers, arguably the most talented team in baseball, have lost in the World Series. Last year they lost to the San Francisco Giants. After looking as though this was finally going to be the year that the Rangers struck it big and became champions, it is beginning to look more like the Rangers are the Buffalo Bills of Major League Baseball with increasing World Series appearances with no rings to match.